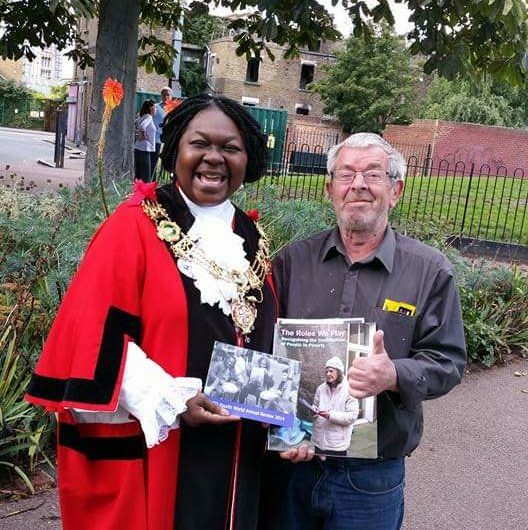 Dora Dixon-Fyle, Mayor of Southwark, and Seamus Neville, Roles We Play project participant. ATD Fourth World, in partnership with artist and photographer Eva Sajovic, is proud to present “The Roles We Play: A Method of Genuine Participation”. This new report, alongside the film of the same name, traces the course of the project over the last decade and its attempts to provide a forum for people with experience of poverty to challenge the widespread negative stereotypes of their lives by giving participants the tools to speak out and have their voices heard. In highlighting its different stages—from photo exhibition and series of residential weekends to participatory film project, full-colour book and multimedia exhibition— the report explores the impact of the methodology at the heart of the project, in terms of the creative work co-produced and the personal development experienced by people living in poverty through this process.